The term 'Bollywood Dance' is a fairly hard subject to write about because it is difficult to define what exactly what this style of dance is and where it has come from. What we do know however that it is this phenomenon that makes Bollywood and cinema in India so very unique. Despite blurriness in the eyes of historians and expects surrounding the exact origins and influences of Bollywood dance and also the extremely different styles throughout the Genre, it is still immediately recognisable. As the slow and steady progress of western culture imposes itself onto the East it is nice to see that somethings are being returned (other than the food)! Like Hindi music - Bolly-dance is starting to subtly but undoubtedly influence Western dance, specifically Hip-Hop and Pop. Second-most to the music, the costumes in any Bollywood scene are the most important. 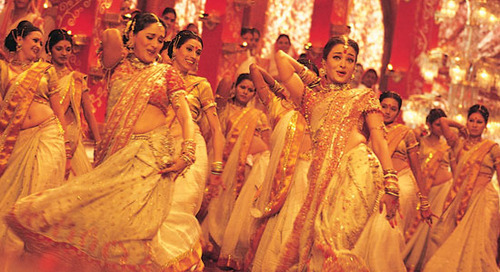 If you have ever witnessed a Bollywood film on full screen then you will understand when I say that a Bollywood dance scene is a piece of art, and it is the costume designer who gives the art it's colour. Going back to the Bollywood films it is amazing to watch how the style has evolved. For example it is easy to in pre 1970s films that the dancing drew largely from folk and classic dance that was so evident throughout the villages and towns of India. Due to India's huge size and geographical diversities, the dancing was different depending on the choreographers home town. And as these along with other dance influences from around India and the world have slowly merged together have resulted in the dance style we see today. If we add to this recipe continued evolution, globalization, fashion and western influence then you can start to appreciate what I mean when I talk about dance in Bollywood being difficult to define. 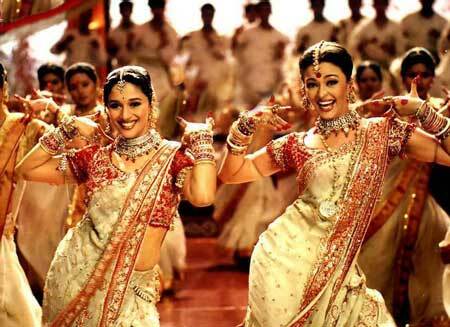 Take a look at some of the videos below to look at some great examples of dancing in Bollywood. I feel here that I should finish with some emotional conclusion about how special Bolly-dance really is to India's, and even our worlds culture .... but I am not going to - Instead I am just going to ask you to turn you speaker up and check out some of these fantastic videos! Thanks If this video doesn't make you smile then I don't know what will! And this one is just downright excellent - Love it!